Global compressor control systems market expected to reach USD 6.77 billion by 2025, at a CAGR of 4.9% between 2019 and 2025. 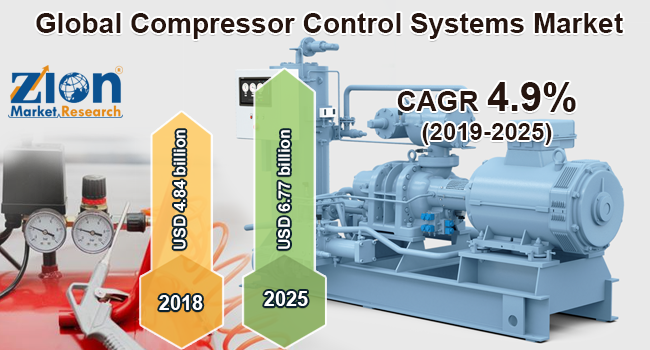 The global compressor control systems market is slated to grow rapidly in the future due to the technological advancements for developing advanced compressor control systems. The report covers a forecast and an analysis of the compressor control systems market on a global and regional level. The study provides historical information for 2016, 2017, and 2018 with a forecast from 2019 to 2025 based on revenue (USD Billion). The study covers the key drivers and restraints of the compressor control systems market. It also provides the impact of the market within the forecast period. Furthermore, the study also includes the opportunities accessible within the compressor control systems market on a global level. In order to offer the users of this report, a comprehensive view of the compressor control systems market, we have enclosed a detailed value chain analysis. To know the competitive landscape within the market, an analysis of Porter’s Five Forces model for the market has also been enclosed. The study further includes a market attractiveness analysis, wherein all the segments are benchmarked based on market size, rate, and general attractiveness. The study also includes the market share of the key participants operating in the compressor control systems market across the globe. Besides, the report covers the strategic development together with acquisitions & mergers, agreements, partnerships, collaborations, and joint ventures, and regional growth of key players within the market on a regional basis. The study provides a crucial view of the compressor control systems market by segmenting the market based on component, application, and region. All the segments have been analyzed based on present and future trends and the market is estimated from 2019 to 2025. By component, the global compressor control systems include controlling and networking components. The controlling components segment is divided into PLC, supervisory control and data acquisition (SCADA), and others. The networking components include switches, gateways and nodes, and others. By application, the global compressor control systems include oil and gas, refining, petrochemical, power generation, metals and mining, fertilizers, water and wastewater, and others. The regional classification includes Europe, North America, Latin America, Asia Pacific, and the Middle East and Africa, with its further division into key countries, such as U.S., UK, Germany, France, China, Japan, India, Brazil, etc. Some key players of the global compressor control systems market are Compressor Controls Corporation, ABB Limited, Atlas Copco, Schneider Electric SE, Rockwell Automation, Inc., Dresser-Rand, Siemens AG, Emerson Electric Co., Ingersoll Rand PLC, Mitsubishi Heavy Industries Ltd., and General Electric Co., among others.